We are about to move. this is our lounge and we quite like the white. 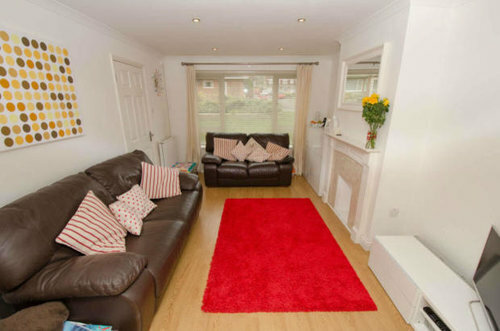 we've ordered a brown chesterfield to go where the larger sofa sits. I'm undecided between two chairs or a love seat where the current 2 seater sits. Also we thought that a bit of colour may work well. Any tips or advice would be much appreciated. Although we've gone for a chesterfield we would like to keep the look modern. I'd be tempted to go with a feature chair. 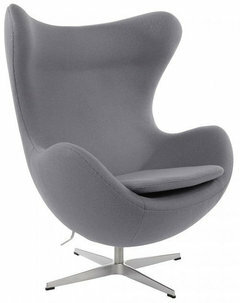 Maybe like a Jacobson egg chair in a bright colour that will contrast with the chesterfield. Maybe a small table next to it and a lamp so it creates a comfy reading area. any advice for this sofa?! I need advice on how to use this hallway space in my rental.